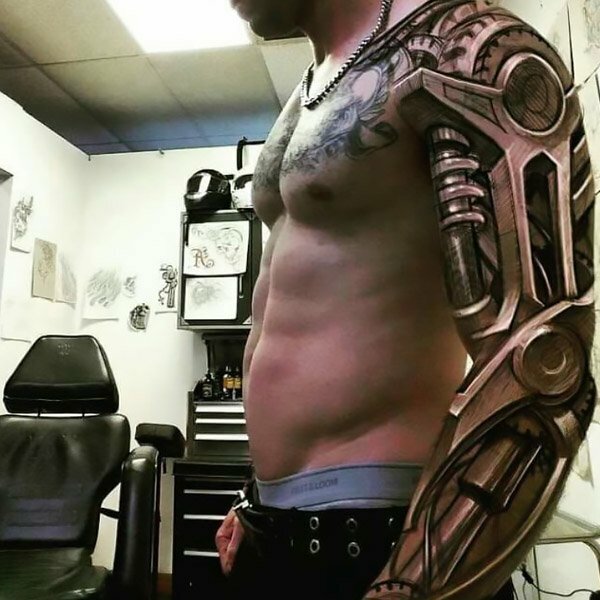 When getting an arm tattoo, go big or go home. These designs aren’t for the faint-hearted, but they will sure make an impact. 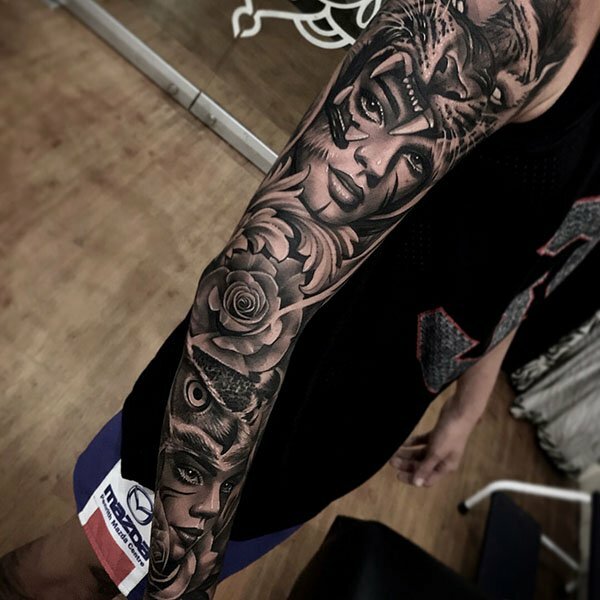 A full sleeve is an excellent option for those who want to paint an entire masterpiece on their arms. 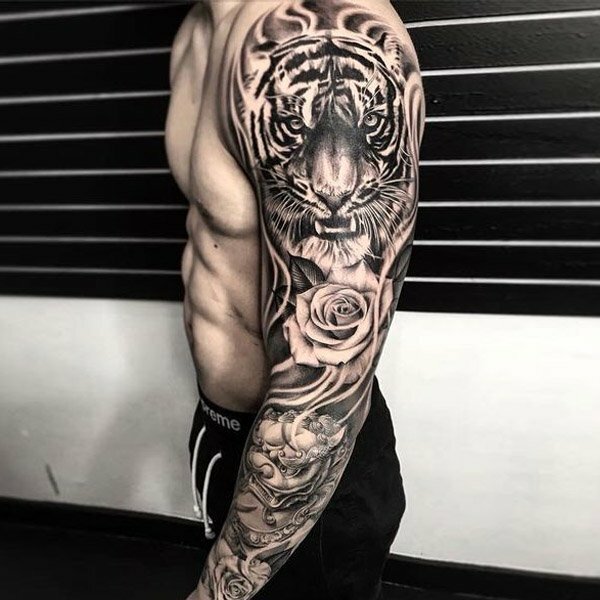 If you’re not sure what piece is best for you, check out these ink-redible sleeve tattoo ideas for men. You don’t have to go all the way up your arm to wow a crowd. 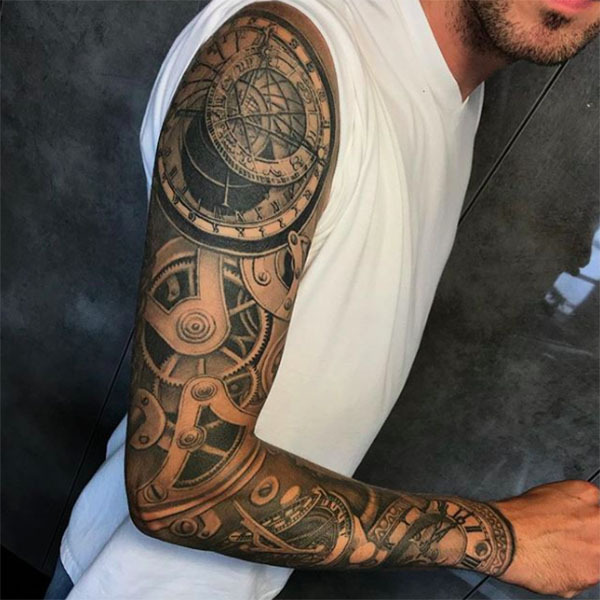 A half sleeve tattoo is an ideal option for those who wish to conceal the artwork for the office or a formal event, but aren’t afraid to let it out when the time is right. 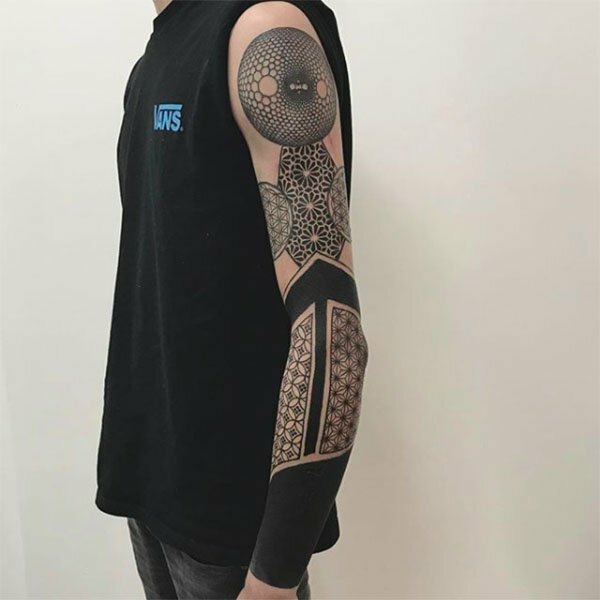 Choose the upper half of your arm for easy concealing access or the bottom half if you’d prefer the design to creep onto your hand and fingers. 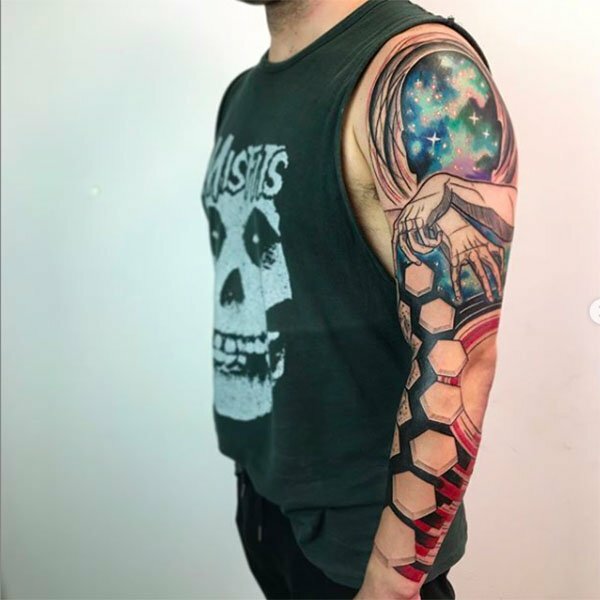 You can’t go wrong with a full sleeve tattoo. From Japanese designs to something black and white, there are so many options to choose from. This is also an excellent choice for those who would like to work their illustration on their back. Let your personality shine through on your skin, and keep a piece of artwork on you at all times. 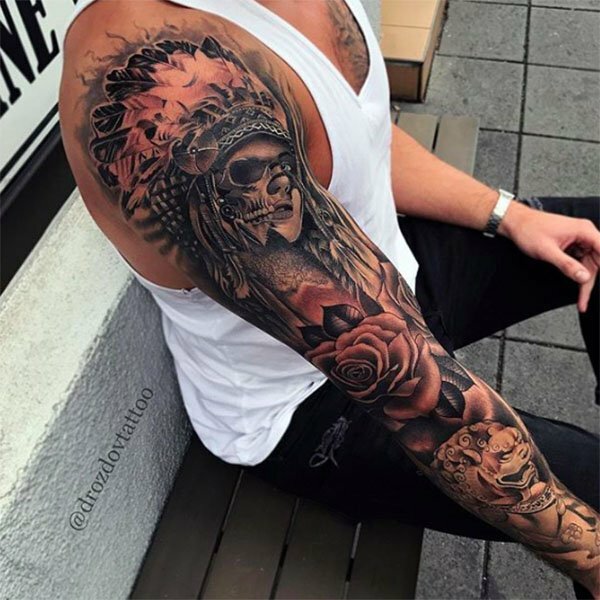 Keep it creepy and cool all at once with a skull sleeve tattoo. These are available in a myriad of designs, so you can find the one that best suits you and your style. 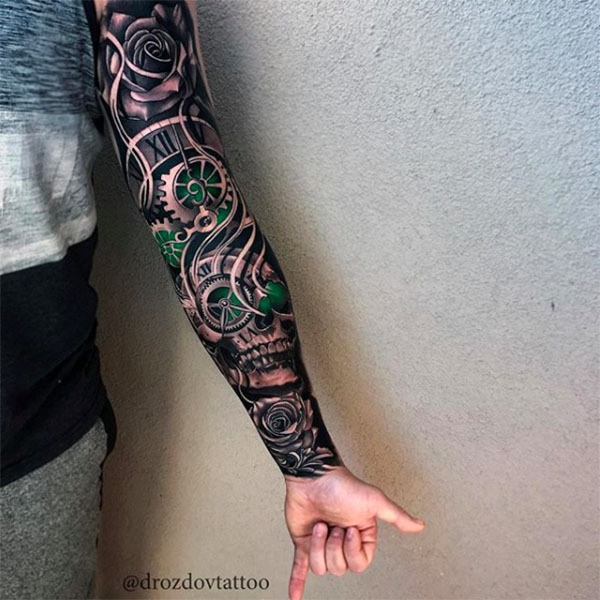 Whether you choose to go all out and recreate a realistic skeleton cascading down your arm, or you’d prefer something subtle, you’re sure to keep heads turning! Let your pride for your heritage shine through with a tribal tattoo. These designs are intricate, powerful and awe-inspiring, so how could you go past it? For the ultimate reflection of the culture be sure to find an artist who specialises in the area; that way you’ll have a piece that’s worth showing off! 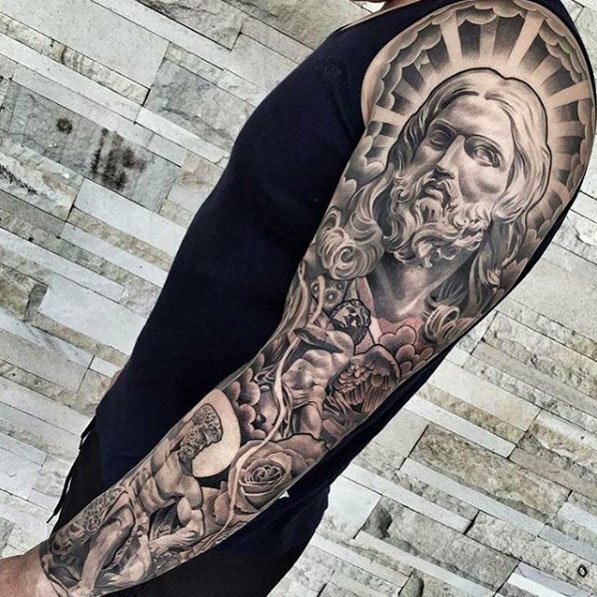 Show your love and faith with this Jesus sleeve. Dedicated to the entire arm this design is compelling and beautiful. 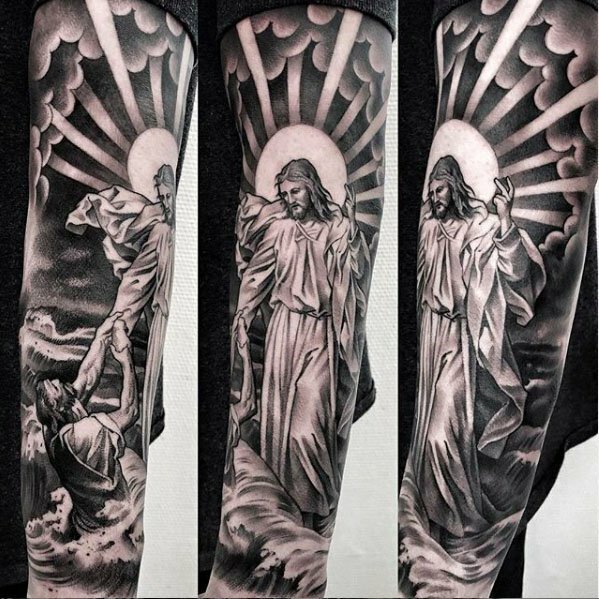 You can choose to feature Jesus as the focal point of the piece or alongside other significant tattoos; you can’t go wrong with something as breathtaking as this. Is that a drawing or real life? That’s what everyone will be asking when they see these 3D designs. Choose a hyper-realistic portrait of a loved one or something abstract, or opt for biomechanics design. 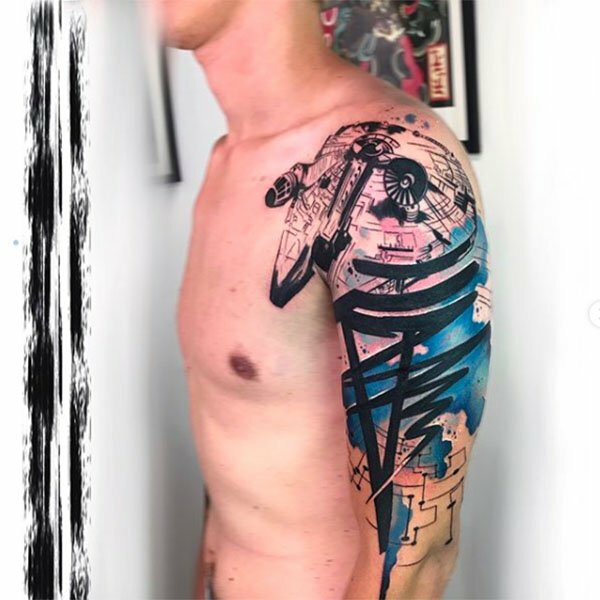 These tattoos look amazing when done correctly, so be sure you find a reputable artist who knows exactly how to master this tricky artwork. Trust us, it’s worth it. 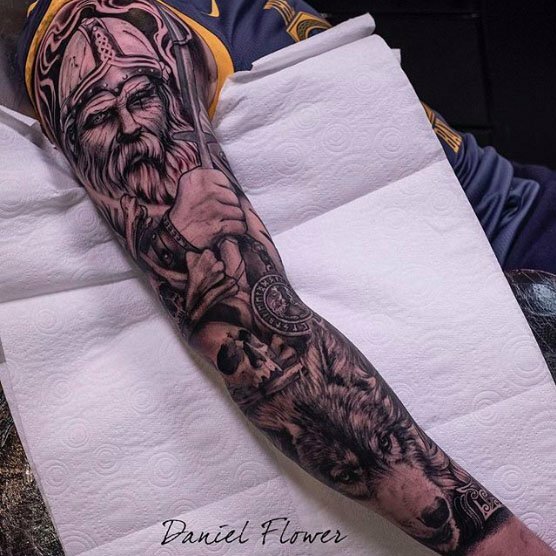 Show your love for the Celts with this Indo-European tattoo. With a traditional intertwined pattern or a soldier, these designs are a timeless option. Typically Celtic artwork features a myriad of knots and patterns; they’re easy to recognise and worth every penny. Direction like this allows you to get creative, so don’t be afraid to get intricate! Feel like Daenerys and be the mother of these dragon tattoos. From Japanese style designs to something medieval, there are so many options to choose from; you’ll want to get them all. You can fill the piece in with colour, so it makes the entire artwork pop. But if you’d prefer something monochromatic, you can opt for a black ink form to blend with the rest of your sleeve. No matter how you wish to style this, you’ll have one of the strongest and bravest mythical creatures with you at all times. Feel the Norse blood rush through your veins with the help of this sleeve. One of the most fierce soldiers of all time, the Vikings, make the perfect design option for strong and brave men. Pair the portrait with other Germanic designs, such as mythological characters, skulls and sailing motifs. These styles look best as a full sleeve, so don’t be afraid to go all out! Tattoos look best when they feature something meaningful. 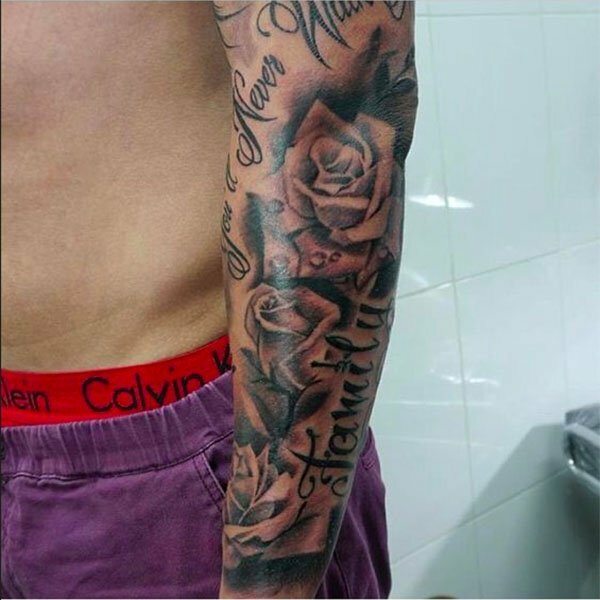 If you’d prefer to have a half sleeve design, why not compliment the artwork with a quote that resonates with you? Whether it be the name of a loved one or a favourite saying, these scripted pieces are sure to make an impact and keep you feeling grounded, no matter what. 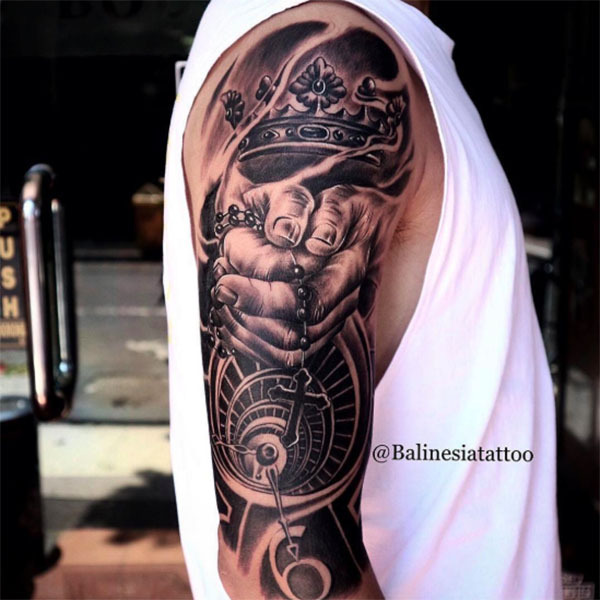 It’s time to get one of these timepiece tattoos. Whether you need to learn how to spend your minutes more wisely or you don’t want to miss a second, these sleeve designs have a personal meaning behind them. Go old school with a stopwatch or head into the digital age with something a little bit futuristic. 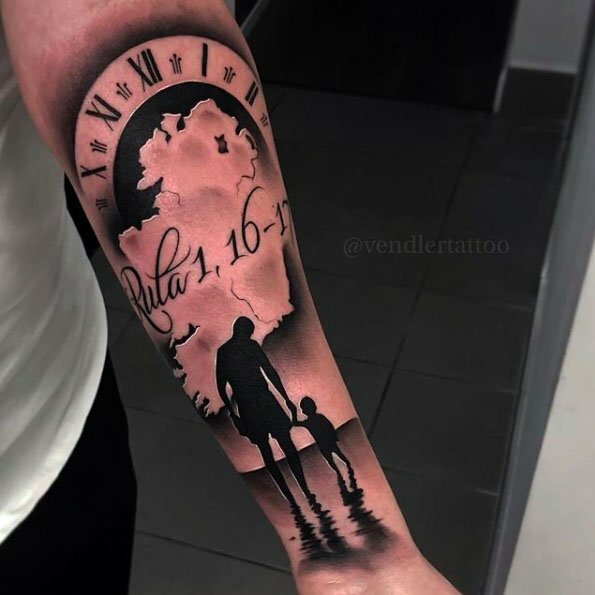 Whatever you choose, you can’t stop the clock, but you can ink it on your skin. 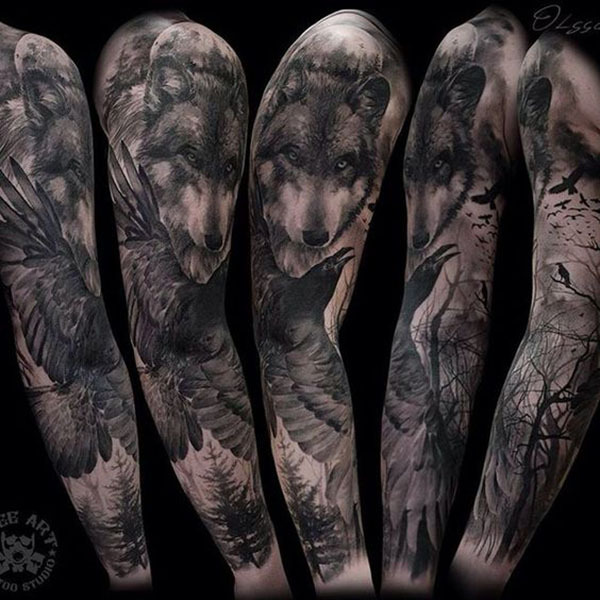 Made for those who are wild at heart, these wolf tattoos can help you unleash your inner beast. Be strong, determined and ready for action; this design looks terrific when done correctly. Be sure to find an artist that is familiar with inking animals. Fur that looks 3D and soft enough to touch is the perfect finishing element to a tat like this. Be true to your faith with these designs. 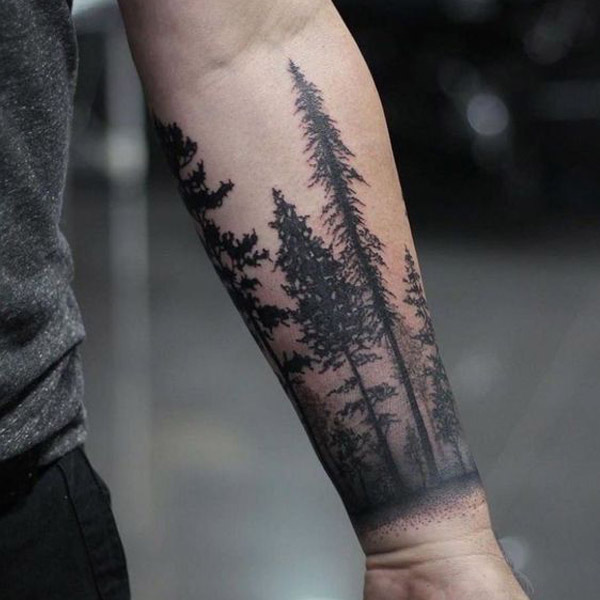 No matter what you believe, it would look great as a sleeve. You can opt for something simple such as a cross, or you can go all out with a hyper-realistic portrait. 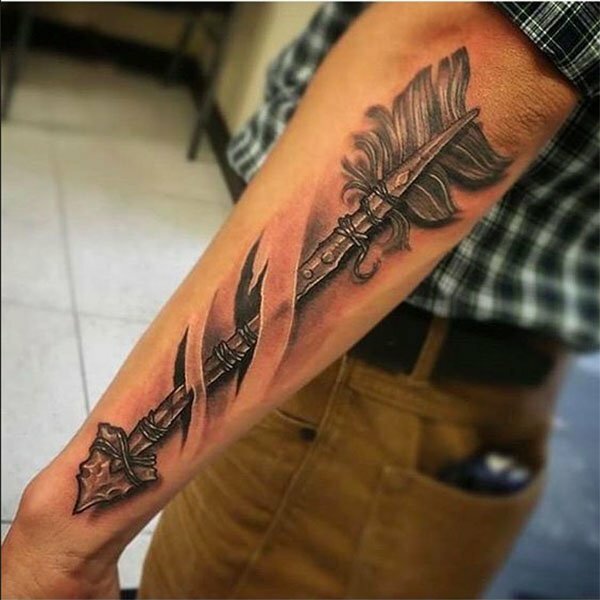 These designs make the ultimate statement, and once you have one, you’ll want to get the other arm done. 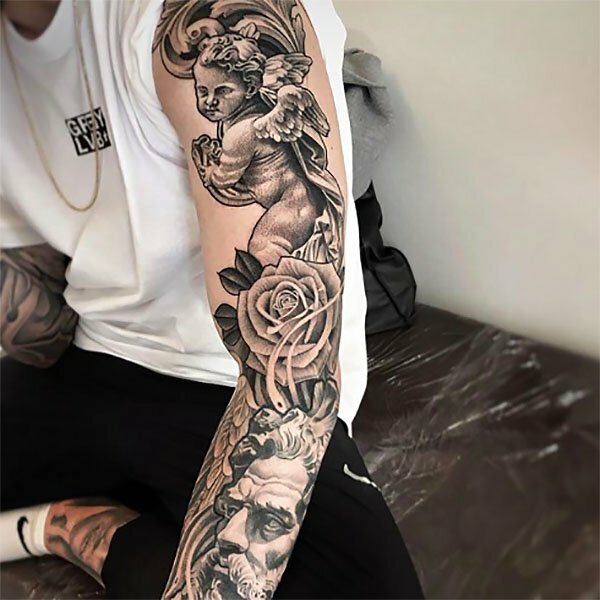 Angels are a perfect piece to feature on your arm. These represent an age of innocence, purity and protection; pair them with other divine drawings, and you’ll have the ideal sleeve to reflect your faith. Choose a cherub that’s asleep, shooting an arrow or playing the harp. With so many options, you’ll be hard pressed finding something that’s better. Dedicate your arm to someone you admire, a loved one or an idol with a portrait piece. From celebrities to family members, these tattoos can hold a lot of meaning and are worth the time invested in them. Pick an artist well; it’s imperative that you find someone who specialises in portraiture; this is a design you don’t want to mess up. When done correctly, these designs are jaw-dropping and need showing off. The cross is a symbol that resonates with faith, so why not showcase your belief with a crucifix tattoo. Whether portrayed as a simple block design, decorated with rosaries or flowers, you can create a unique design that’s both badass and respectful. Go all out with a colourful depiction or keep it graphic with something 3D in black ink. No matter what you choose, this is a timeless piece that blends perfectly with other designs. Feel the beat through your skin with this ink. From a single treble clef to a full symphony, let the music in you come out with these fantastic tattoos. Creep a manuscript up the arm, illustrate your favourite instrument, microphone or a DJ turntable. Whether you’d prefer an oboe or an orchestra, this is a flawless composition for a pitch-perfect sleeve. Head in the right direction every time with these arrow sleeves. These designs signify guidance and remind you to always move forward. You can ink a traditional dart on your arm or something geometric. Think outside the box with a 3D illustrated piece, and add shadow for an ultra-realistic approach or keep it simple for a huge impact. This is a timeless design that’s packed with meaning. It’s something we all have, so why not celebrate it? From chosen members to the ones we were born with, families are a part of our lives that offer us the support and guidance. Choose to portray them in a realistic portrait or ink their names. This is a touching way to pay respect and honour those who are closest to you and can be the perfect way to keep them with you forever. Take things outside of the box with a watercolour tattoo. This is the ultimate way of expressing your personality, so why not go all out with some vibrant colours? 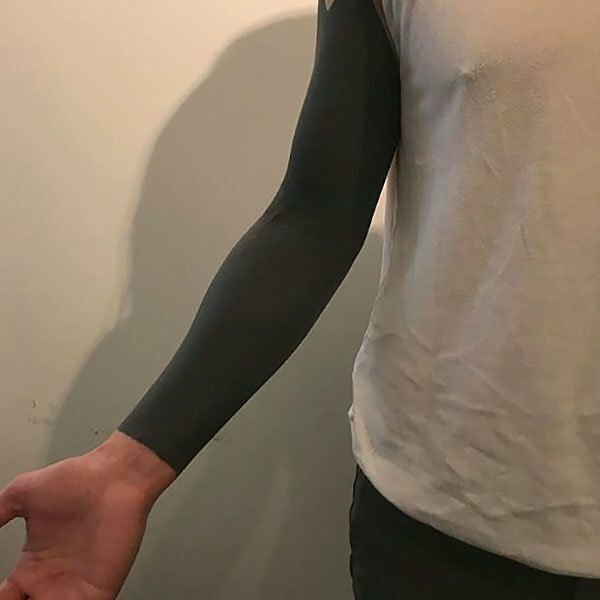 This sleeve idea gives the impression that you’ve had splashes painted on your skin. They can look strong and powerful or delicate and intriguing, no matter how you wish to present this fantastic design, you’re sure to attract attention. Not all tattoos have to have a traditional approach. For artwork that makes you think and let your imagination loose, opt for an abstract sleeve. There are no rules with this idea, dig deep in your creative side and let your fantasies out. From shapes, thought-provoking designs to futuristic patterns, you can’t go wrong with something out of the ordinary! Well oiled and ready for action, mechanical tattoos are for the working man. A combination of steampunk and traditional designs, these pieces signify the past, the present and the future. Choose from a timepiece or something robotic. 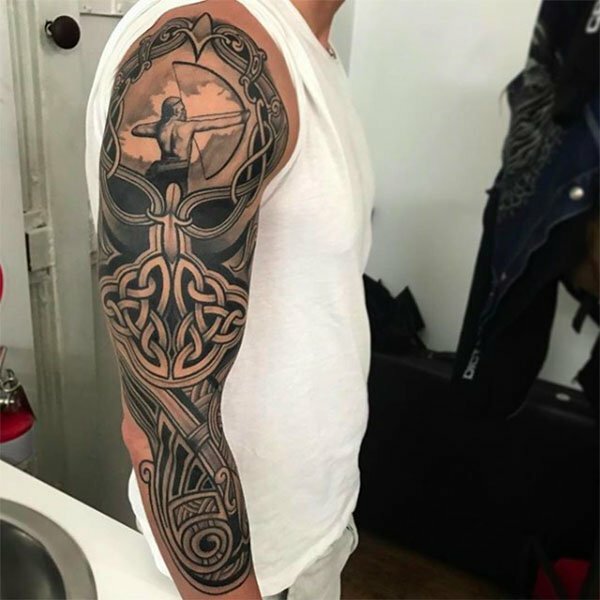 You’re going to be hard-pressed finding someone with a better sleeve than you. Get back in touch with Mother Nature with these designs. Flora, fauna and all things in between make the best artwork, so don’t be afraid to set your sights on all things natural. 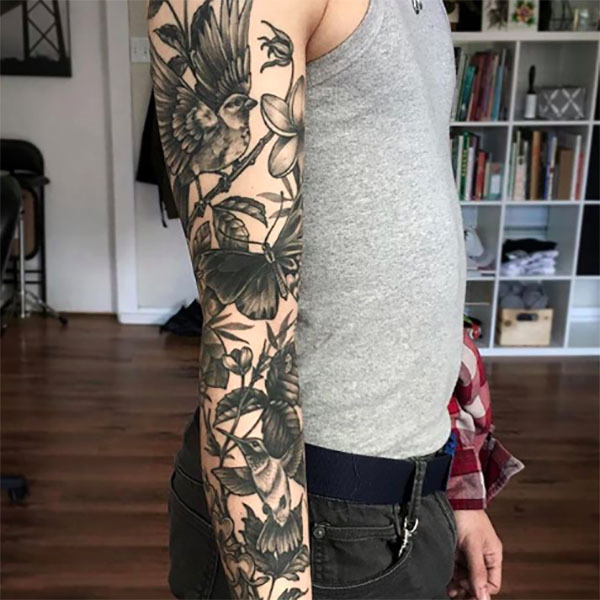 Choose from the traditional rose tattoo or express your love for plant life with a selection of birds, flowers and other botanical illustrations. These pieces look best with bold colours or in black ink. Whatever you wish to feature, you’ll be one with the Earth instantly. Not all ink has to be colourful to make a statement. 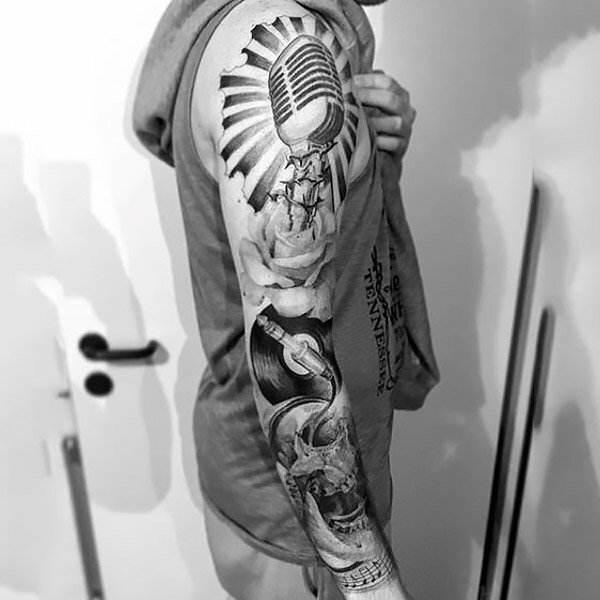 Black and white sleeves are also an impressive feat to portray on your skin. 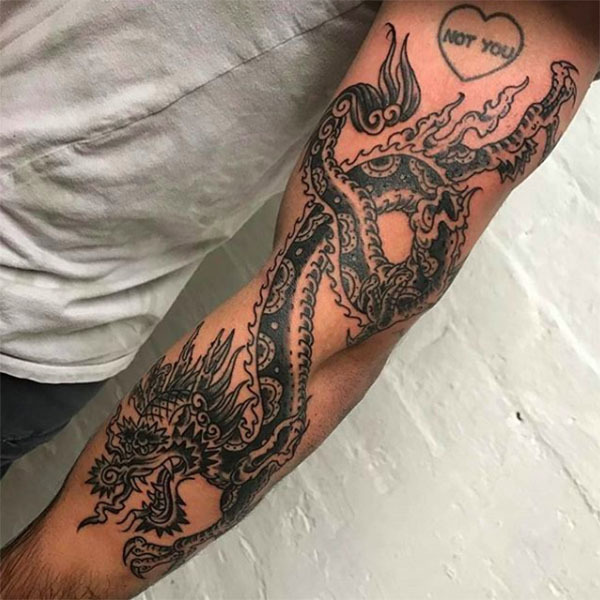 Bold and sharp, these designs are the best option for people who don’t want to touch up their tattoos as often as coloured pieces. The ones that love us never really leave us. 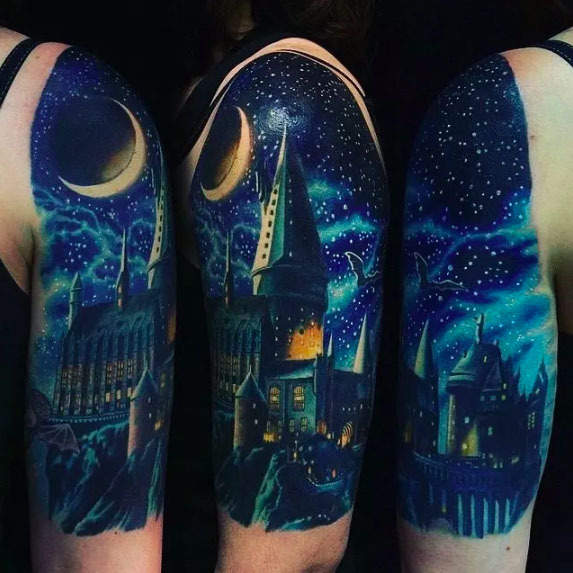 For Harry Potter fans, this sleeve is the ultimate way to show your dedication to the witches and wizards of Hogwarts. From the Deathly Hallows to portraits of your favourite characters, you can show the world how much J.K Rowling’s writing means to you with this beautiful art. Who says there’s a rule book when it comes to tattoo designs? For those who want to stand out amongst the crowd or who wish to hide their past mistakes, blackout sleeves are the perfect option. These pieces take a fair amount of time to complete, so be patient as your arm slowly dissolves into pure darkness. 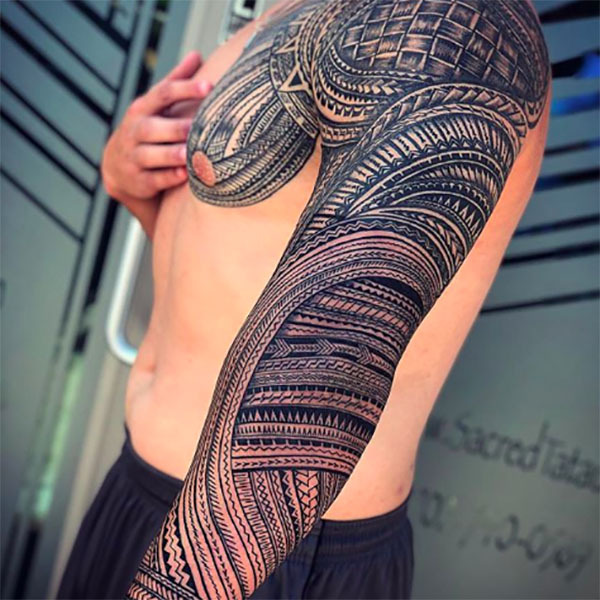 This design isn’t something to take lightly, so be 100% ready to commit to this intense ink.